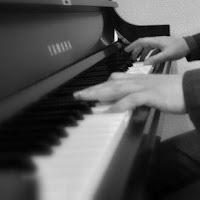 Most of you know by now that I play piano and organ. If you didn't already know that, well, I do! I recently launched a new web page dedicated to my music. On http://www.mikeyfullermusic.com/ you'll be able to listen to some samples, book an event, or learn more about my experience in music. I'd love for you all to pop over and check it out, then pop back here and leave a comment letting me know what you think. And don't worry--Shabby French Cottage isn't going anywhere! Come back tomorrow for photos from my trip to Lynchburg, VA this past week-end. Boy have I got some fun things to share with you.